The permitted level of noise in any venue is determined by the local environmental health officer (EHO). The sensitivity of the G920A can be set-up in accordance with any of these regulations. If the permitted levels are exceeded in any venue where a G920A is installed and the warnings ignored, the offending equipment will be temporarily disconnected from mains power. The G920A can be helpful with regard to legislation concerning Noise in the Workplace. One or more units can be used as display units indicating sound pressure levels or to switch on warning lamps or illuminated signs to advise the need to wear ear defenders, when the safe noise level is exceeded. The G920A can also interface with a fire alarm (24V) or remote cut-off switch (not supplied). Warning Time: 30 sec. Standard. Adjustable between 5 - 90 sec. Sanction Time: 30 sec. Standard. Adjustable between 5 - 90 sec. flashing green = fire alarm or initialising. Optional extras: G920B Remote indicator panel, G920C audio interface. 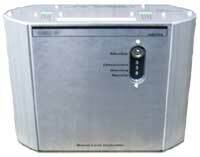 Environmental Noise Limiter for venues needing to control mobile guest sound systems. You determine the maximum level within the range 70 to 110dB. If the maximum level is exceeded, the warning LED will start flashing. From then on, the DJ/performer must play less loud. If not, the main power will be disconnected (time delay adjustable). The decibel level is measured through the included wall-mounted omnidirectional electret condenser microphone. The central unit is tamperproof with all setup adjustments inside and only a security key bypass on the outside. Selectable A or C weighting to EN60651. If the microphone becomes faulty or unplugged, the main power will be disconnected until the microphone is plugged-in again! In other words: a very effective and easy to install system! PACKAGE CONTAINS: Central control unit, external microphone, ready for installation by a qualified electrical contractor.